‘Tis the season.. for Candied Cranberry Pomegranate Prosecco Spritzers! This is the magical time of year when cocktails abound and cranberries go with/on everything. If you’re feeling fancy, I highly suggest you make these candied cranberries. They are perfect for holiday cocktails, party snacks, morning oats, and more! They are crisp and sugary on the outside, and tart and juicy on the inside. Simply delicious! I knew I wanted to use them for a fancy holiday cocktail but they are perfect on their own just as a snack. One of my favorite aspects of throwing a party is planning the food and drinks. I love creating recipes that make my guests feel merry and celebratory. And what is more celebratory than sparkling wine? I chose to use Prosecco because I’m obsessed with all things Italian and I love dry sparkling wine. But these Candied Cranberry Pomegranate Prosecco Spritzers would also be very delicious using Champagne or sparkling Rosé. Speaking of celebrating, we’ve recently reached a milestone here at Carrots and Flowers! This week, we surpassed 50,000 fans on Facebook! Also, Peta shared our Deep Dish Pizza video on their Facebook page! It’s so incredible to see so many photos pop up of people making our recipes. IT. IS. THE. BEST. So yeah, it’s time to celebrate with these fancy cranberry cocktails! If you don’t drink, you can swap the Prosecco for Kombucha or sparkling cider. Either way, the candied cranberries and pomegranate syrup are a must try with your beverage of choice. So festive and flavorful, it tastes like the Holidays in a gorgeous little flute glass. If you try this recipe, please rate it in the comments below and tag a photo #carrotsandflowers on Instagram. It will make our day! To save this recipe for later, pin the photo below. Cheers, friends! I hope you’re all having a lovely holiday season so far. Stay tuned for more deliciousness! A DELICIOUS and festive holiday cocktail! 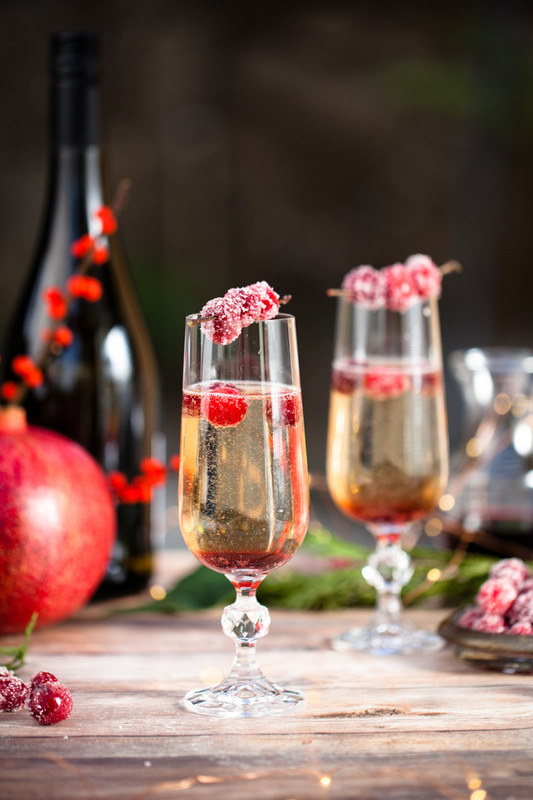 Candied cranberries and easy pomegranate syrup in bubbly Prosecco. Combine ½ cup sugar and ½ cup water in a medium saucepan over medium heat. Stir until the sugar dissolves, about 2 minutes. Add the cranberries and stir to coat evenly. Reduce heat to low and cook for another 2-minutes. Be sure to not let the cranberries burst. Using a slotted spoon, transfer to wire rack; let dry for at least 1 hour. Add the pomegranate juice to the sauce pan and let simmer on medium to medium low until reduced by half, about 10 minutes. Stir occasionally. Working in small batches, coat the cranberries in remaining ½ cup sugar until well coated; let dry for at least 1 hour. Prepare the drinks with 1 part pomegranate syrup to 3 parts Prosecco. Serve with candied cranberries as a garnish or in the glass. Or both! *Candied cranberries are best eaten fresh or within a day. Store on the counter loosely covered with a paper towel so they stay crisp. *Use leftover cranberries in oatmeal, on ice cream, or serve as a party snack.